By the time a cat is 4 years of age, there’s an 85% chance he has some form of dental disease. Cats are notorious for hiding signs of discomfort, even from their closest people. So, it’s imperative that we see even seemingly healthy cats at least once per year. At Cat Care of Vinings, we make an oral exam a part of this preventive care visit. Dental disease begins with the buildup of plaque and tartar on the teeth and gums. Over time, saliva mixes with plaque and bacteria forms. This bacteria works its way under the gum line, causing inflammation of the gums (gingivitis). If left undisturbed, this progresses to tooth structure damage, decay, and eventual tooth and even bone loss. This bacteria doesn’t just stay in the mouth, though. It is swallowed and can lead to damage of your cat’s internal organs, such as their heart, liver, and kidneys. Periodontal disease is often related to another tooth condition unique to cats, stomatitis. Stomatitis is the severe and painful inflammation of mouth and gums. Ulceration of the mouth and gums frequently occurs. Treatment depends on the level to which your cat is affected, but a dental cleaning and removal of one or more teeth is often recommended. Complete oral health exam – at your pet’s annual preventive care visit, examine your cat’s mouth. Although we can get a cursory look, a full dental exam occurs once your cat is anesthetized for their dental cleaning. We need to be able to probe the gum line around each and every tooth to assess it’s health, and this can only happen under anesthesia. Dental x-rays – the next step is to take radiographs of each tooth. This will help us assess the internal health of the teeth, and give us a literal picture below the gumline, a critical part of tooth health. If any teeth are beyond saving, we’ll extract them to save your cat from painful tooth decay, fractures, and tooth loss. Dental cleaning and polishing – once we know which teeth are healthy, we’ll clean them and polish them. This removal of plaque and tartar occurs not only on the surface of each tooth but under the gumline as well, something that can only be accomplished when your cat is under anesthesia. 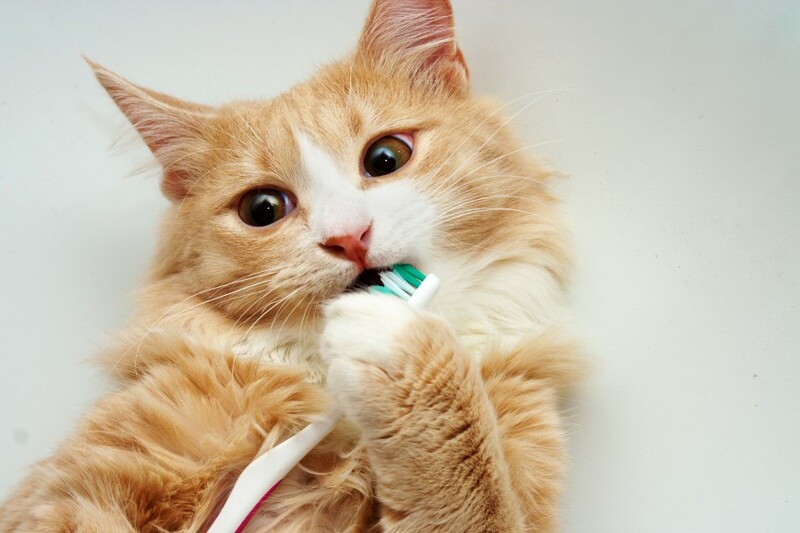 You can continue to keep your cat’s teeth and gums healthy at home with regular tooth brushing. We can show you how! This is the single best way to make your cat’s dental cleaning last. We may also recommend a dental health diet or chews for your cat, but there really is no substitute for brushing. We may also recommend a rinse to add to your cat’s water. If you have questions about your cat’s health or cat dental care, please don’t hesitate to give us a call or schedule your cat’s appointment. We’re always happy to help cat owners give their feline companions the very best health and wellness. Next: A Quick Guide to Feline Behavior: What Does It Mean When Cats Hide?